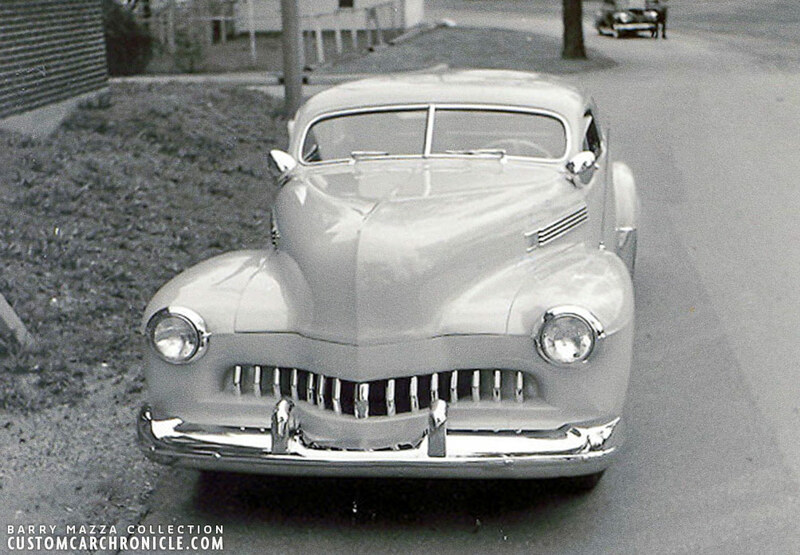 Most of the time we think of dark painted cars when we think Early Style Custom Cars. But there were actually quite a few light color Early Customs. Lets take a closer look. 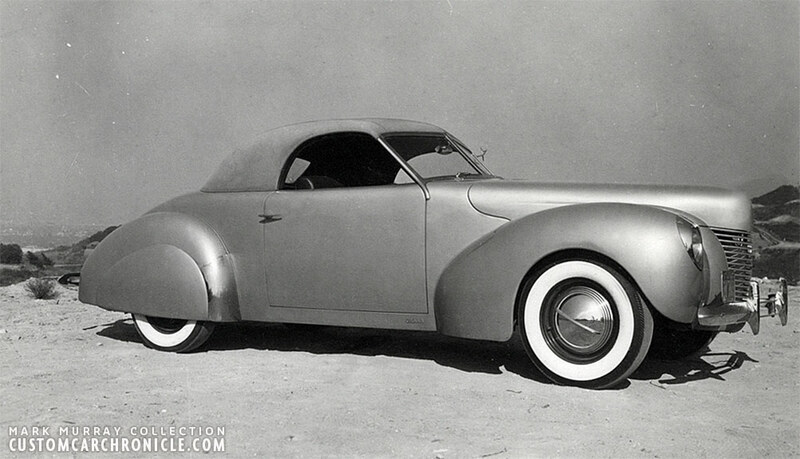 I guess that when somebody asks you to visualize an early Custom, from the late 30’s up into the lat 1940’s, you most likely end up seeing a dark painted Customs in your head. During these Early Golden Years of Custom Restyling the dark deep organic paints, perhaps with a hint of bronze metallic powder dominated the scene. Colors based on dark hues from General Motors, mixed with darker toners, and clears, applied in multiple coats to create extra depth were often considered trade marks for some of the best known builders. These dark and deep colors enhanced the new body lines, showed off the excellent body skills these crafts man had. These dark colors were a perfect way to show off how perfect they were in blending body panels, every flaw in the body work would show up with these mirror gloss dark colors if not absolutely perfect. But there were exceptions… There were a good number of Early Customs that were painted with light colors. I think that using lighter colors on early Customs has its origins – as many other elements in the history of Custom Restyling – in the Coachbuild or Exotic High-End cars. Quite often. These early coach build and high-end cars had very bright vibrant Colors, to set them further apart from the showroom models. The same thing could ave been done with early Custom Cars, the light, bright colors made them look even more different that the mostly dark colored cars that came from the factories. 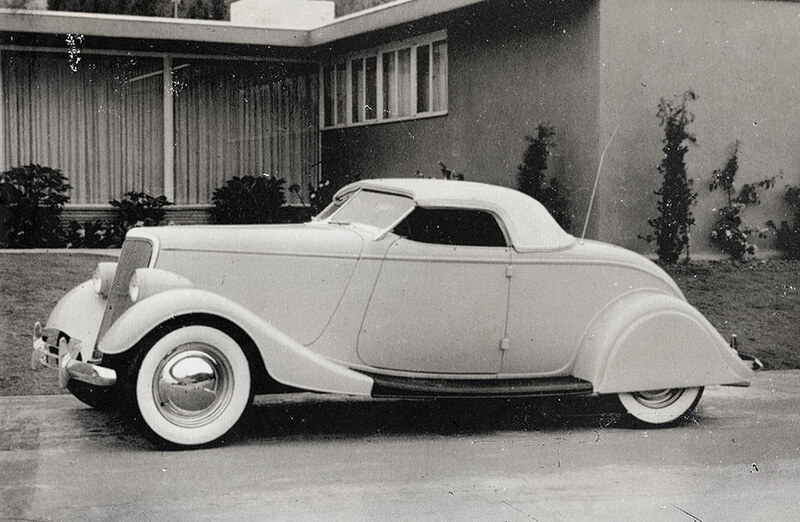 Clark Cable’s ’35 Duesenberg is one of the most famous light colored cars that comes to mind. 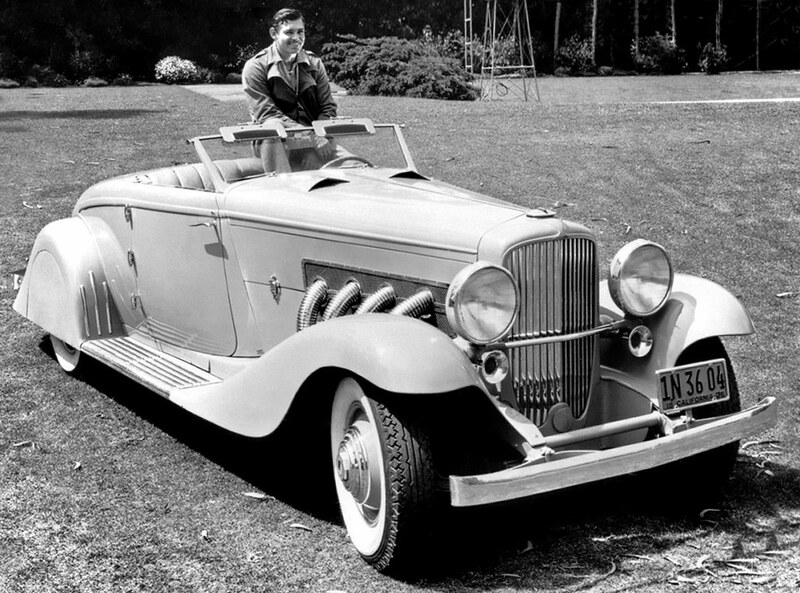 Clark Cable’s 1935 Duesenberg, a huge car, looked even larger with its light color. And perhaps Hollywood had something to do with the lighter colors as well. 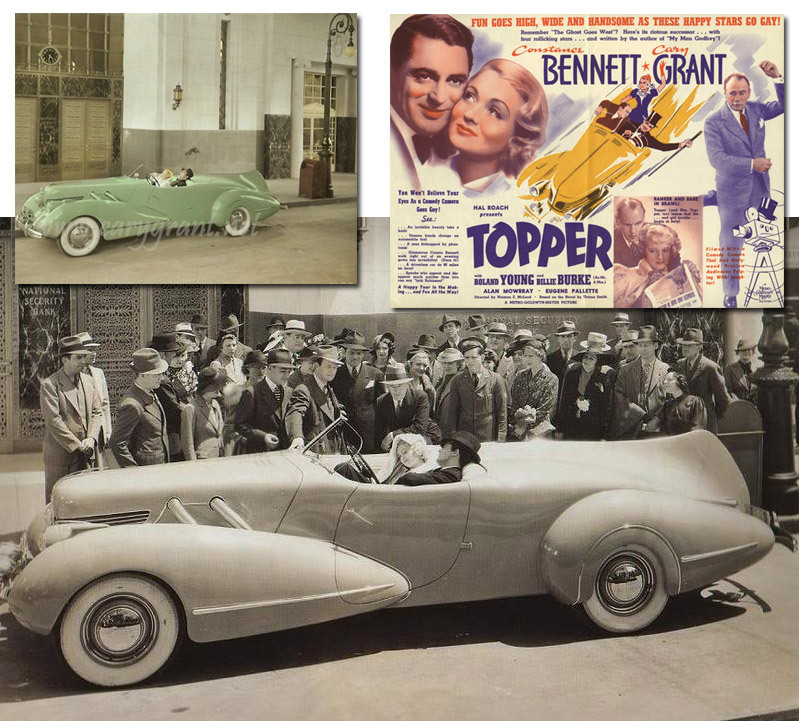 A few of the early Custom Restyled Sports Customs created specifically for the movies were light colored as well, as this Topper movie car for the movie featuring Constance Bennett and Cary Grant. For me personally I have always thought that the Custom Cars from my favorite era, the late 30’s up to the late 40’s looked the very best in very dark deep organic colors. But for the past couple of years I have started to really enjoy some lighter colors on these early customs, both from vintage photos’ as well as for more current creations clearly inspired by the original early Customs. 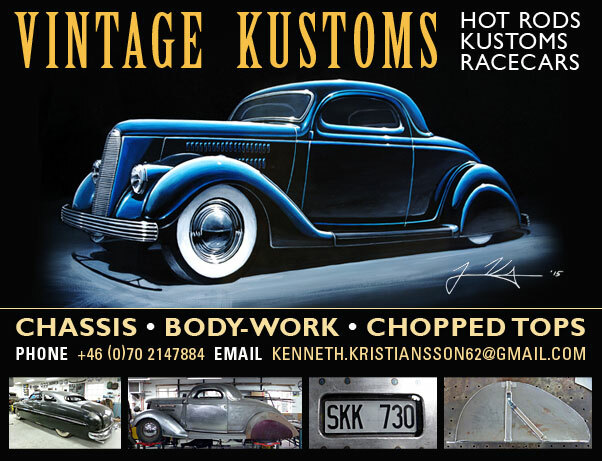 The ’36 Ford Roadster created by Altisimo and the 37 Chevy created by Paul Cepeda and a few years earlier a beautifully mild early 440’s styled ’39 Mercury convertible are just a few samples of recent created light colored Early styled Customs that have made a huge impact. 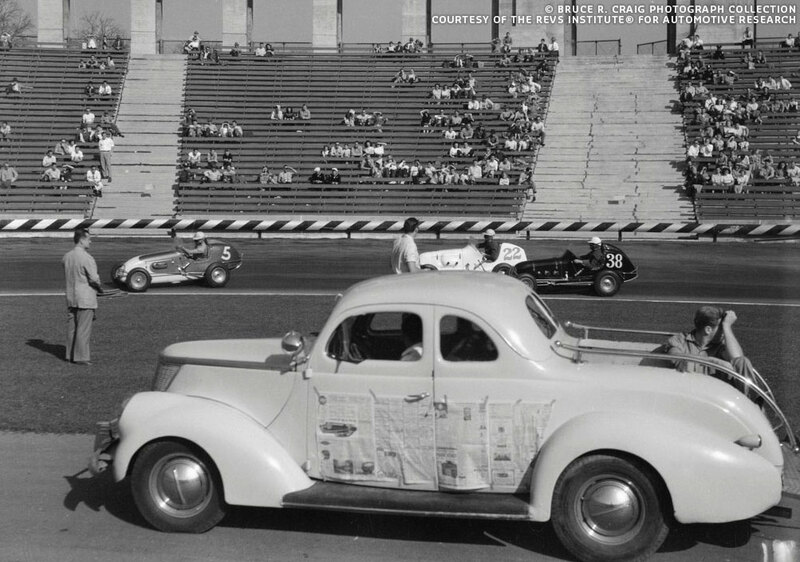 The Wes Collins / Al Marx 1934 Ford roadster with DuVall windshield and Padded top was originally painted black, but in the later part of the 1940’s repainted in a light color, making the car look a lot taller. 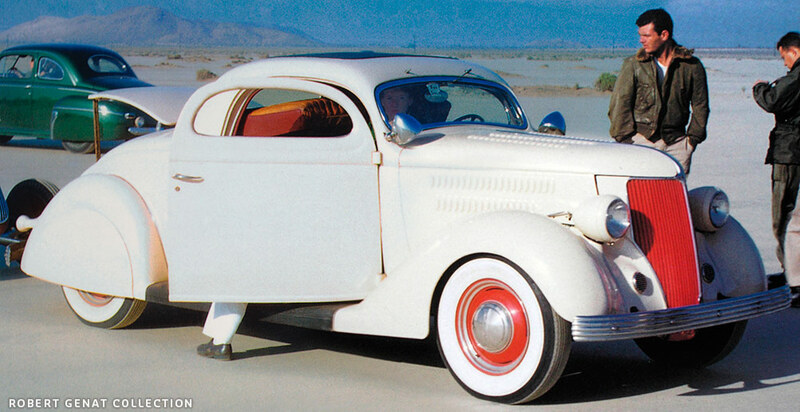 Perhaps the best known light colored early Custom Car is the off white painted chopped ’36 Ford for Bob Pierson. Frank Sandoval’s 1936 Ford Coupe looking fantastic in a light color. 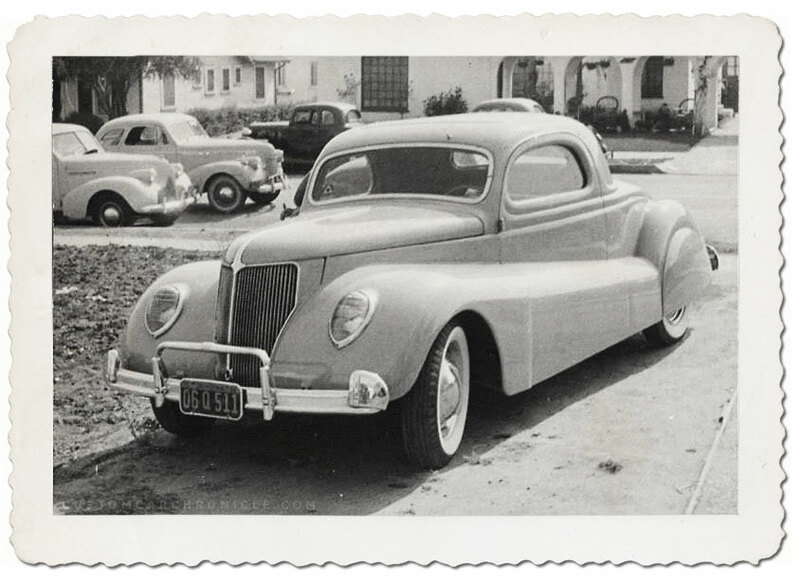 Late 1940’s photo shows 1936 Ford 5-window coupe with the rear quarter windows filled in, narrowed grille and 1940 Ford headlights mounted on the front of the modified ’36 Ford fenders. And painted in a light color, making the car look classic, and taller than it really was. 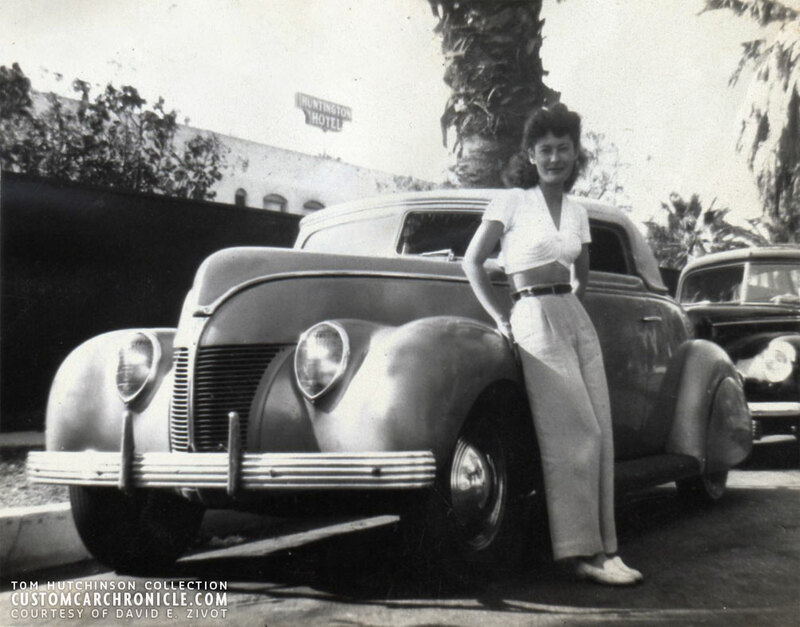 Jim McKinley’s ’36 Ford Coupe must have looked stunning with its 20 hand-rubbed coats of light cream lacquer and contrasting fire engine red grille, wheels and backs of the DeSoto bumpers. 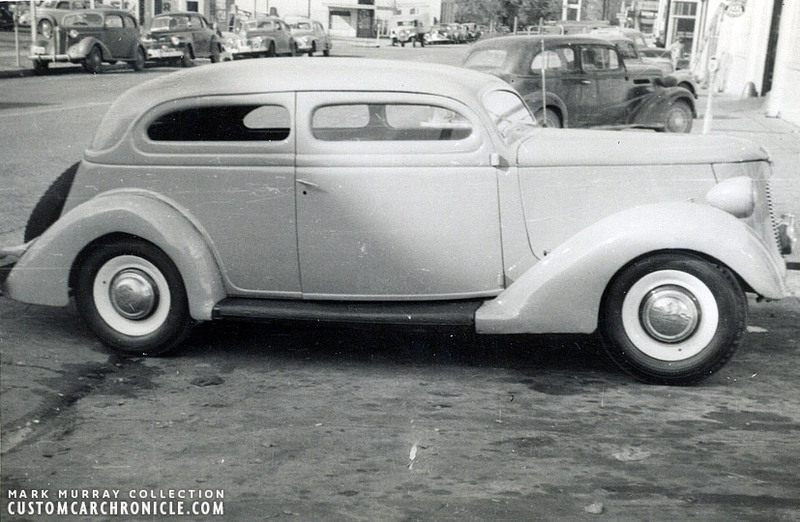 This heavily chopped ’36 Ford Sedan went thru several versions, first one done in the later part of the 1930’s was with dark paint and a white canvas covered top. 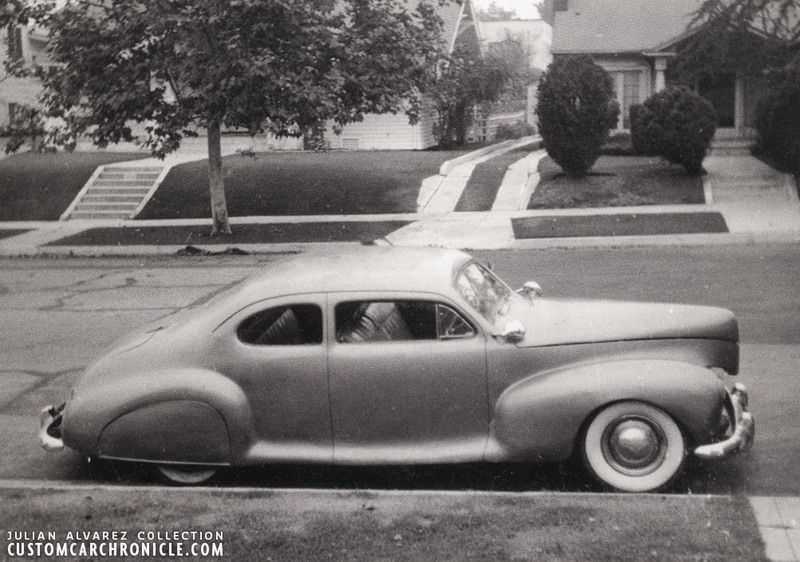 Later, in the 1940’s the car was redone with a metal top, and new light colored paint. This photo was taken during, or shortly after WWII. 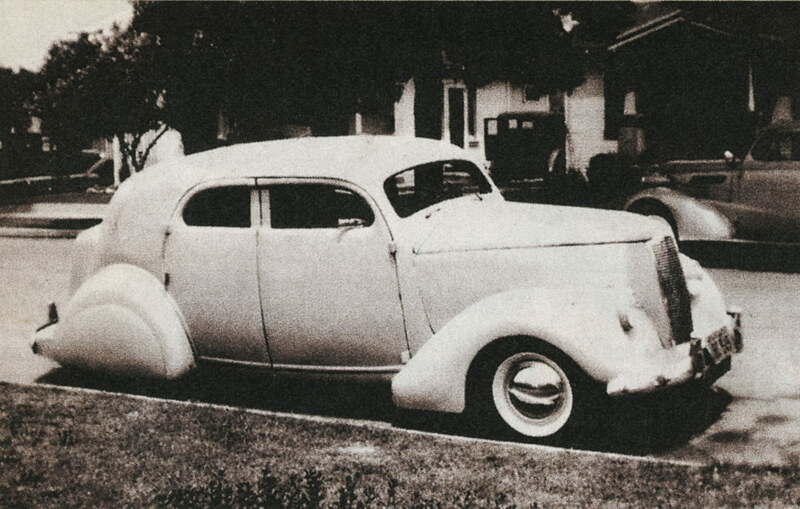 Jay Everette’s 1936 Ford four door with chopped top and filled in rear quarter window. 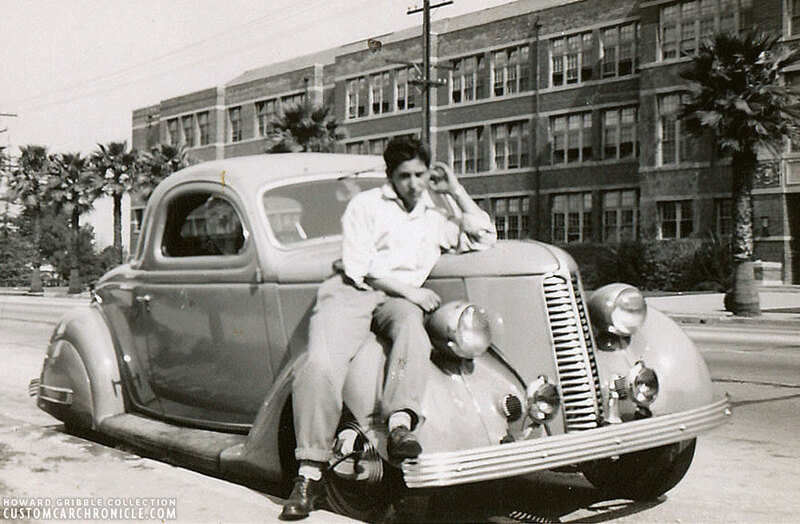 In an phone interview Jesse Lopez ones told me that when he was working with Sam Barris on his 1941 Ford Coupe he thought about painting the car in his all time favorite color, light pale yellow. And he was very serious about actually painting his to be iconic Custom Car that color. But in the end, he decided to got the more common, route and find a dark organic color. Imagine what might have happened if Jesse had painted his car in a light color. 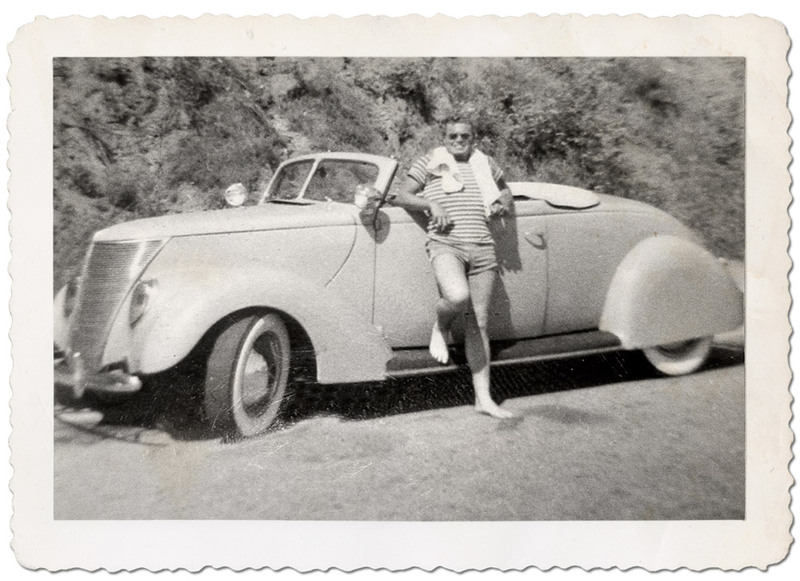 The Coupe was very well known in the late 1940’s up into the mid 1950’s. 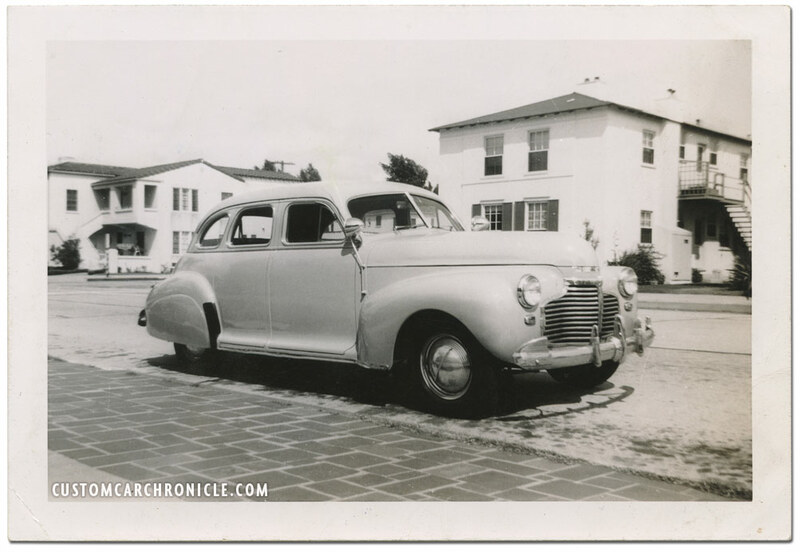 Could have had the car just as much impact with the light color, or perhaps it could have resulted in many more light color painted customs in the later part of the 1940’s…. who knows. 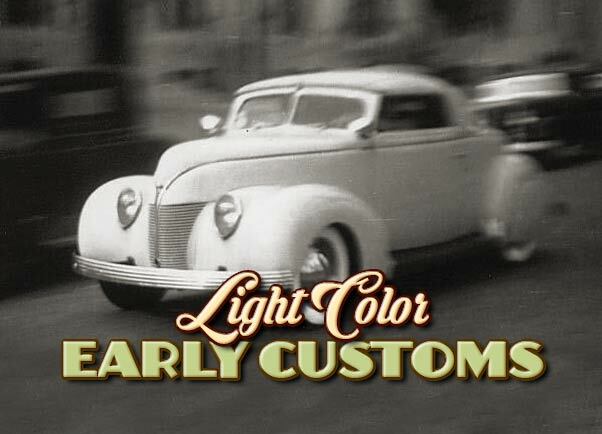 Sadly we do not have many early color photos of these light colored Custom Cars, so we do not know much about which colors or hues were used, or if special effects as bronze or silver or even pearl powders were involved. We know that all these special products were available at the time., so it is quite possible that the Custom Car pioneers experimented with these products. But more than likely these lighter colors were mostly based on factory colors, perhaps specially mixed to suit the car even better. 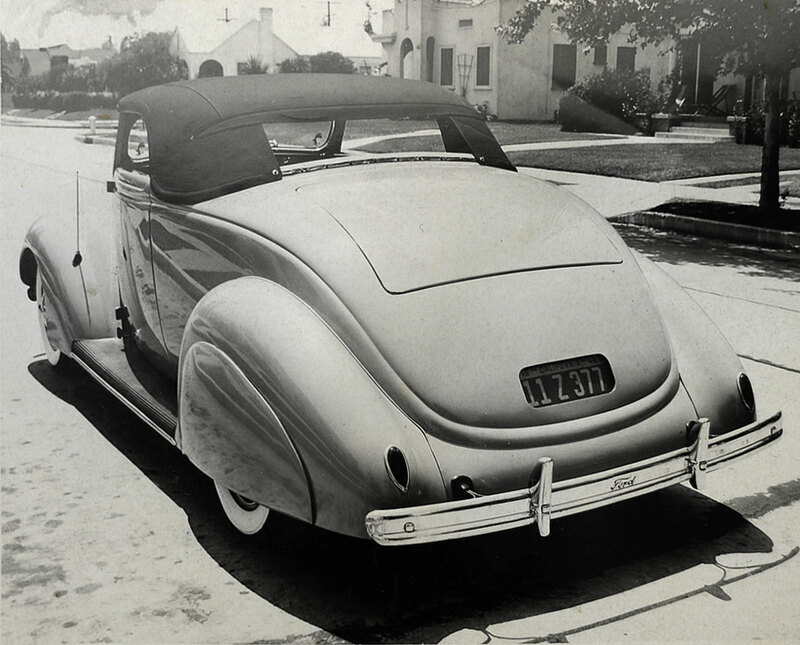 Unidentified 1937 Ford convertible with dark colored chopped padded top, set in license plate, and bubble skirts. Another unidentified ’37 Ford convertible with chopped windshield, smooth hood sides, Appleton Spots, lowered stance, custom hubcaps and white wall tires looked very good with a light paint job. The tarp on the back indicates the top might have been white. Restyled ’37 Ford coupe made into a pick up in 1938 when the car was brand new. 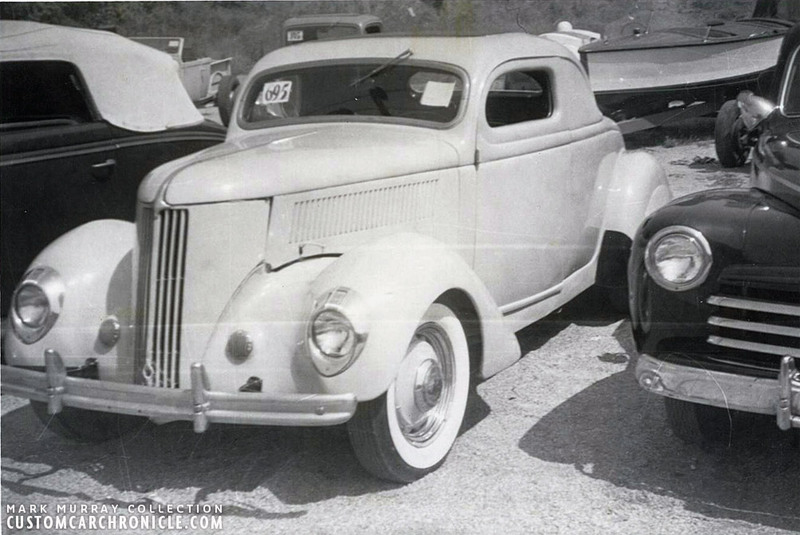 This photo is very interesting since it shows an ’37 Ford four door convertible with aftermarket Auburn style exhausts coming out of the hood sides. This indicated that the owner was looking for an more exclusive look for his chopped convertible. Perhaps that was also the reason for his choice of a light color on the main body, and a dark color for tthe top and above the belt line. 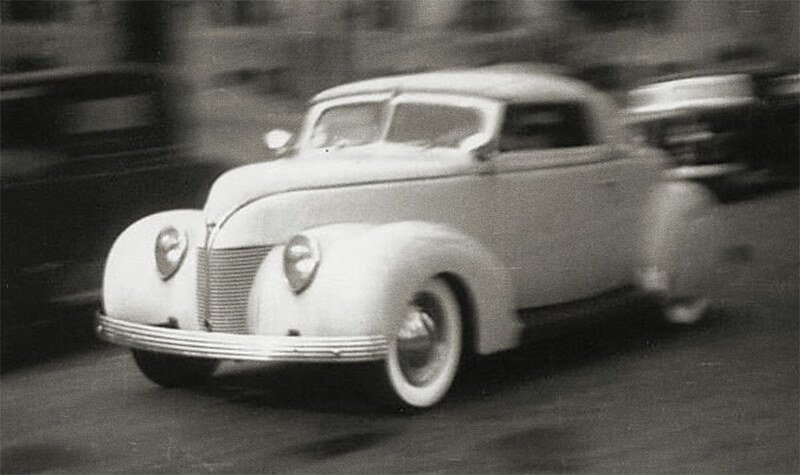 I really love this photo of this ’38 Ford convertible on the streets in the 1940’s. 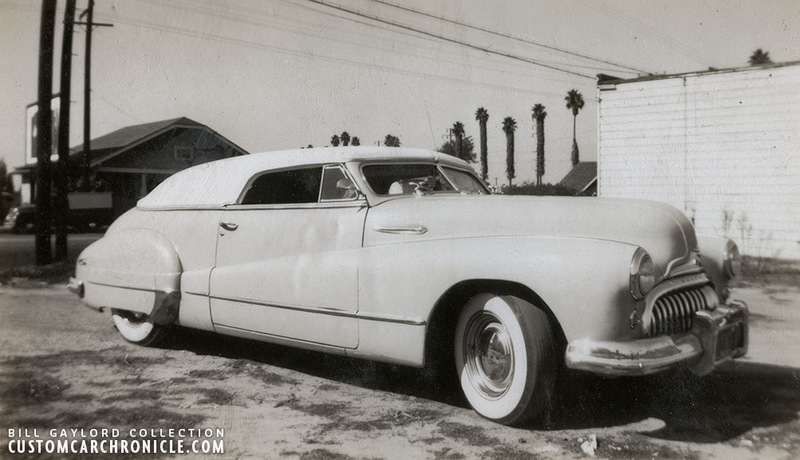 light paint, light padded top, white wall tires… Classic. 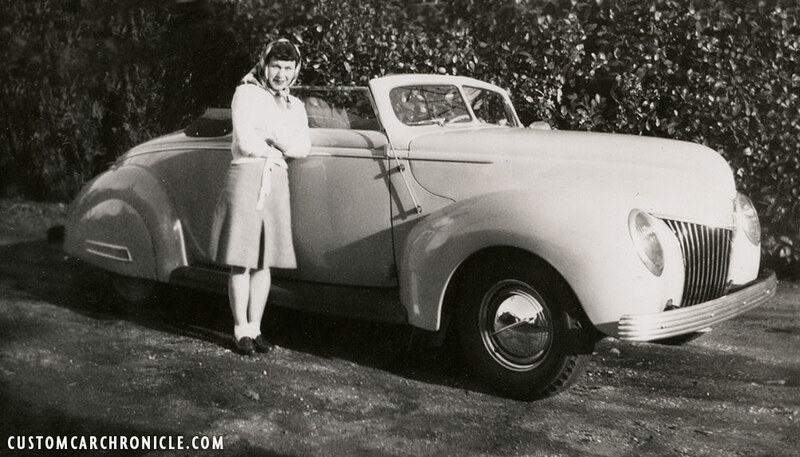 Very similar restyled ’38 Ford convertible as the one above, but it is a different car photographed during WWII. ’39 Ford convertible with chopped windshield, teardrop skirts, black wall tires, single bar flipper hubcaps, ’37 DeSoto bumpers. 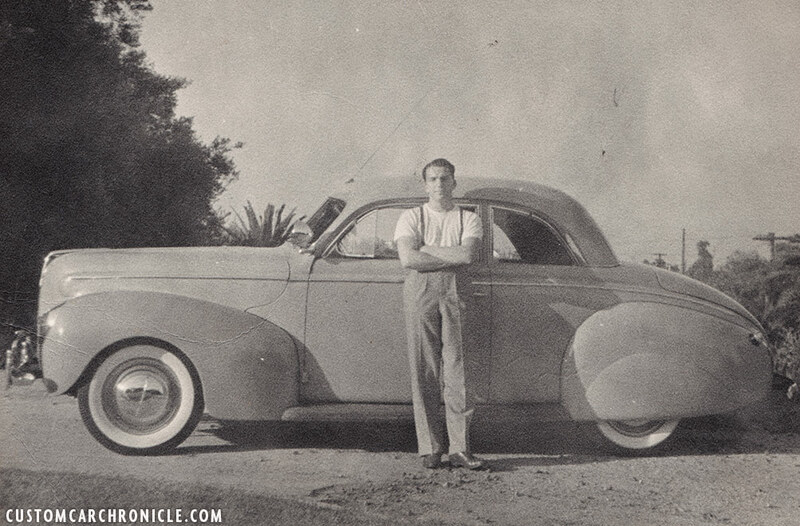 Coachcraft build 1940 Ford in 1940 with a mostly hand build body which was painted in a light color, that might have been silver. Mildly restyled 1940 Mercury Coupe that might have even been its stock color, possibly Sahara Tan. 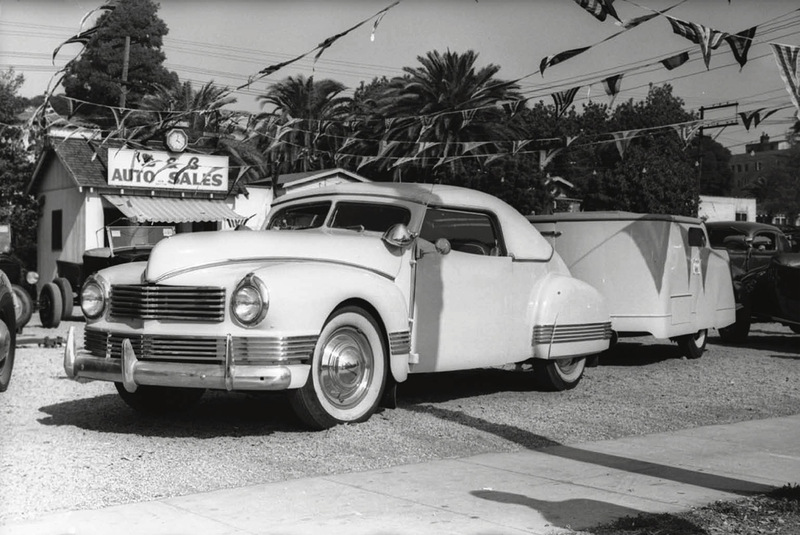 Another Coachcraft restyled car is this 1941 Cadillac with later grille and beautiful fade-away fenders, V-Windshield and padded top had a very classic look enhanced by its light color. 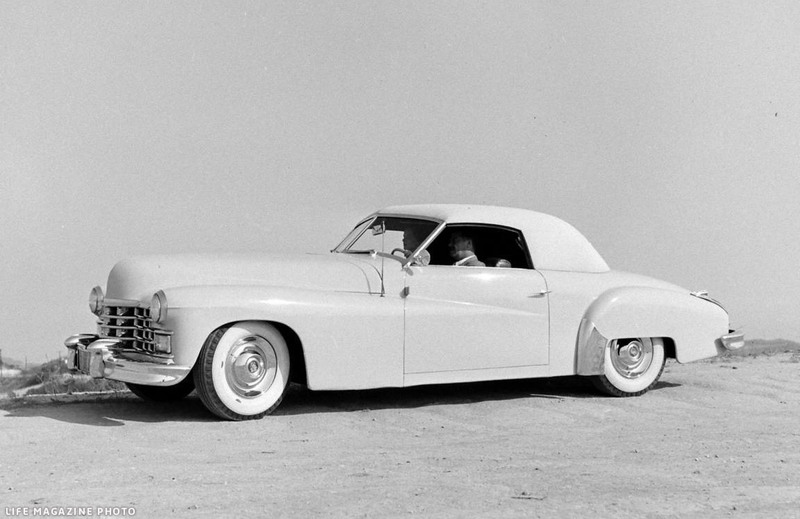 1941 Cadillac owned by Paul Dallmeier was restyled in the late 1940’s, and updated with a light color in the early 1950’s. Light color on a huge car making it look even bigger. Unidentified custom ’40 Chevy convertible with chopped padded top and wide hand made grille looked really good painted in an unknown light shade. 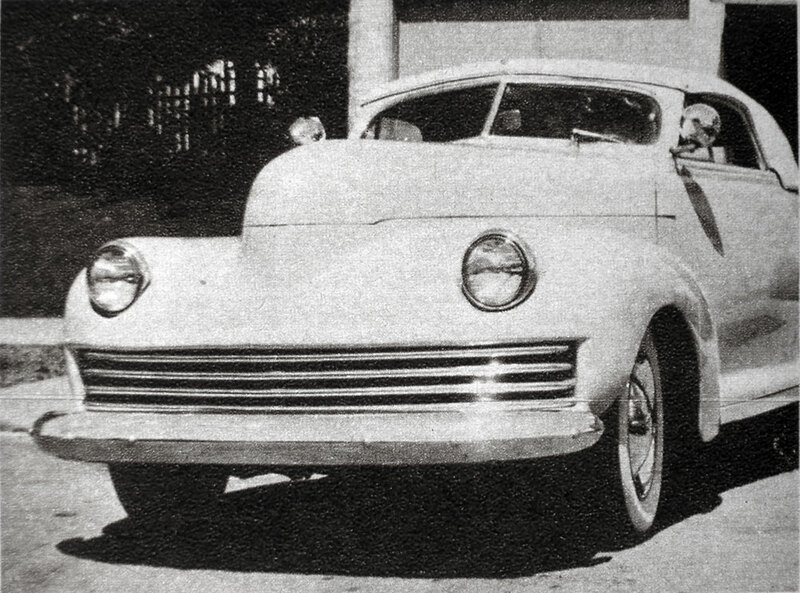 Possibly based on a 1942 Nash Convertible, this unidentified wild custom was also painted in a light shade. But since the Carson top looks lighter, the color has to be darker than white. 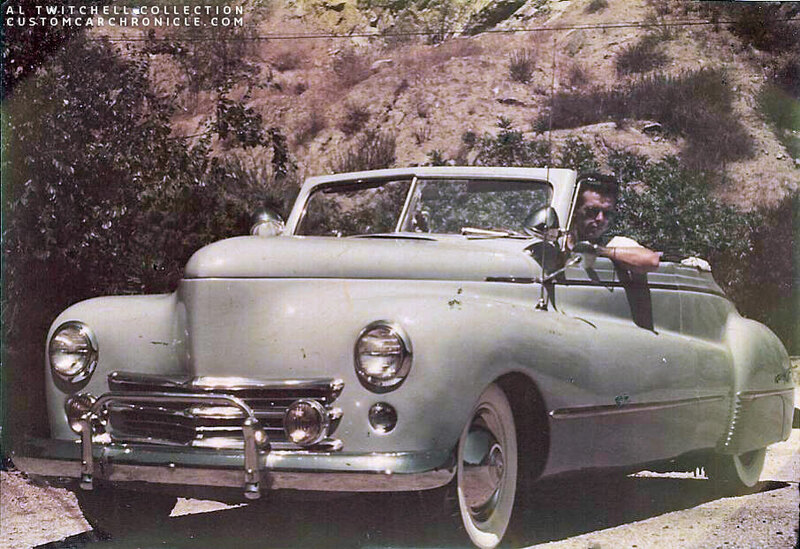 Al Twitchell’s 1941 Plymouth is one of the few color photos were have found of the early restyled Customs with light colors. Al did all the work on the car himself, including the light baby blue paint. This 1940 Chevy 4-door is a milder custom, but still has some very nice body work going on with the shaved doors and removal of trim. Unsure is if the original light color was touched up on the body worked sections, or if the owner choose an an all new, light color for his custom restyled Chevy. From the Julian Alvarez Collection comes this light colored beautiful mildly chopped Lincoln. Chopped windshield, white padded top by Gaylord’s and light painted, most likely factory stock color that was matched on the windshield and hood. 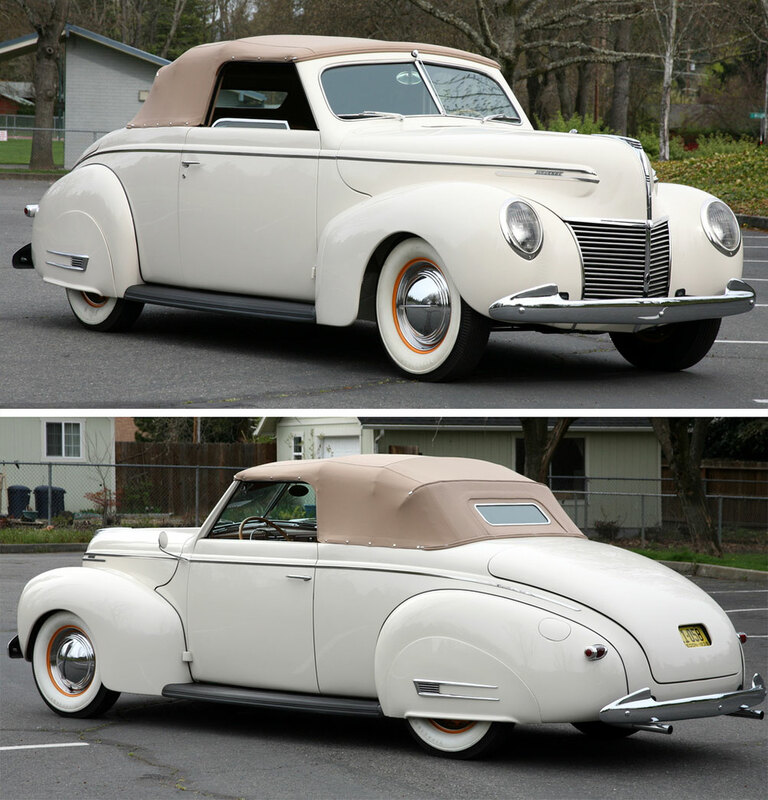 One of the cars that really got me into appreciating the light colors on early customs is the Murray 1939 Mercury mildly restyled convertible. Which was very inspirational, and refreshing to me after being used so much to all the dark organic painted customs. 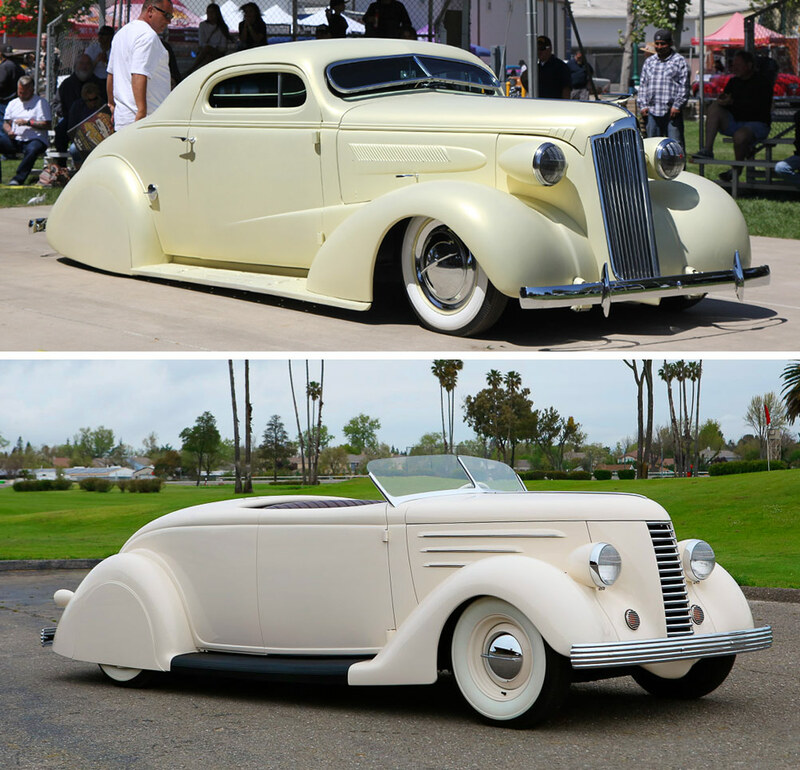 Two other cars that were done recently that got me inspired for this article are Paul Cepeda’s 37 Chevy painted pearl pale yellow, and the ’36 Ford restyled by Altisimo. The later one being more traditional, but Paul’s Chevy very inspiring because it is a coupe. 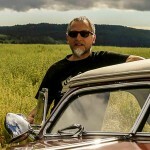 Cool article Rik! 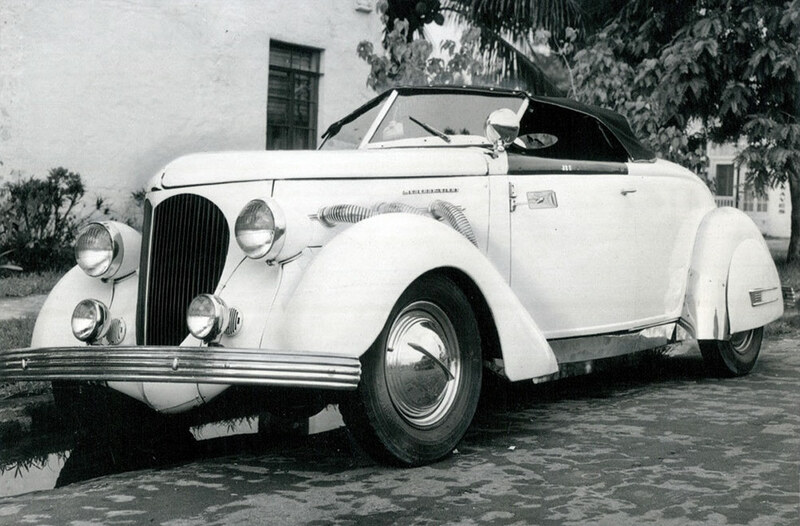 I have always liked the light colour customs and have thought that it would be cool to have a car painted in one of the cream colours offered by some of the higher end manufacturers like the Packard Cream or the Cord cigarette cream. 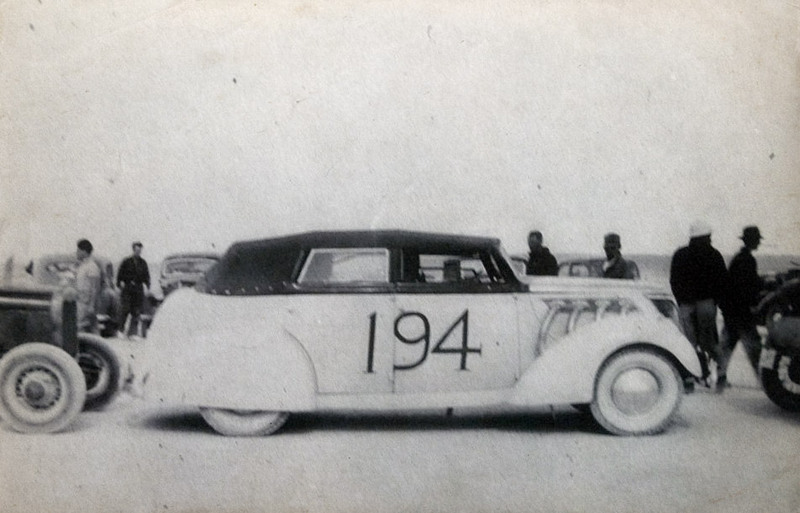 There is something very elegant about those late 30’s cars with cream paint. And of the course the Chuck Porter custom truck comes to mind as well. This is a great article. I have always liked the light color customs. Great stuff Rik.